It's 3pm, the sun is warm and the light is turning a yellow-gold over the snowcapped mountains and summer meadows of British Columbia. You're immersed by the natural rhythm of the grass blowing in the breeze and the gentle sway of your horse from side-to-side. Your mind is relaxed, your gaze softens into the distance with a quiet perspective. Your friend leans over and gently pats their horse on the neck. You do the same, thanking them for taking you on a day of adventure you'll never forget. These horses, this experience, is a reminder of who we are, our connection to nature and the simplicity of a life well-lived. Up ahead is a roaring campfire, fresh home cooked-food, a glass of wine and a night under the stars surrounded by wilderness. Doesn't that sound amazing? It truly is. And don't worry if you have no riding experience. 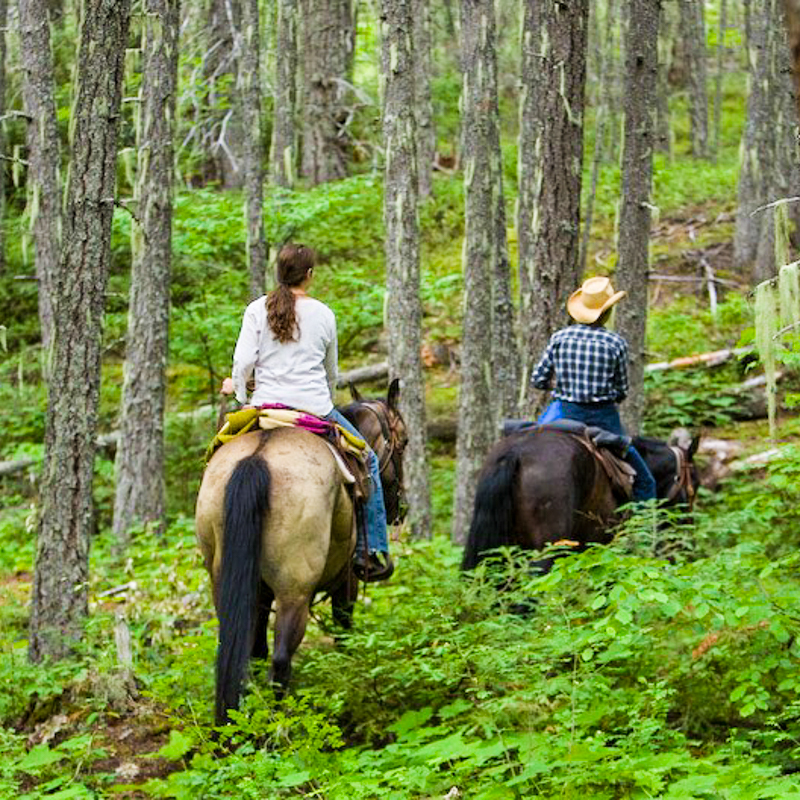 Even if you've never sat on a horse, you're in safe hands with our experienced cowboys and cowgirls on one of our overnight horseback riding trips. Sure-footed gentle mountain horses will carry you to each campground where our guides set up camp and cook a dinner around the campfire. Over the three days you will get to know the horse that we have picked to match your abilities and learn to appreciate their nature. 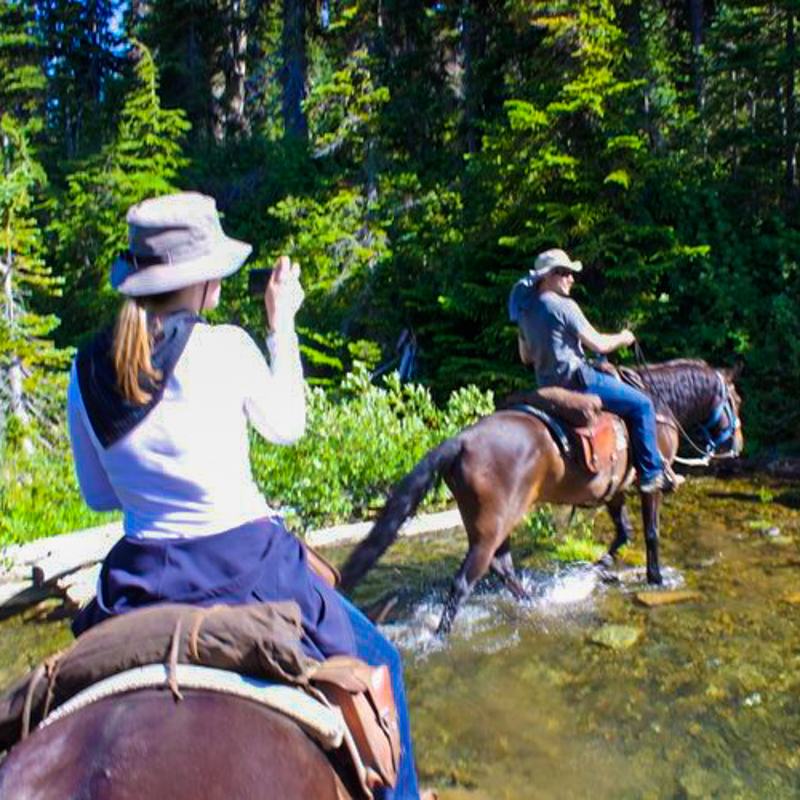 We hope you'll see that you should not feel intimated by overnight horseback riding trips. If anything, spending multiple days on a horse is the best way to go from never-ever to confident rider in one trip. The first day will find you riding 15 kilometers to our base camp where you will then meet up with your luggage. Our base camp is equipped with a hot shower and outdoor plumbing along with tents mounted on platforms to provide that extra level of comfort for our guests. 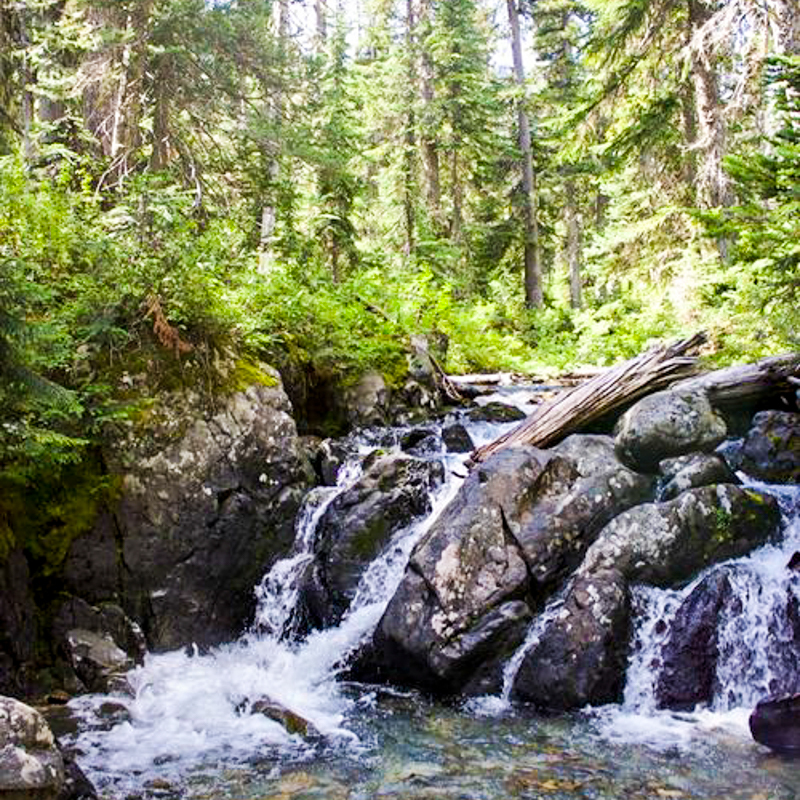 From there you’ll enjoy day rides to various locations of interest (waterfalls, viewpoints, lakes and more) with each day ending with campfire evenings and comfortable tent lodgings. Something with a light stretch that is also breathable, like a long hiking pant, is perfect. It can get real hot in these gorgeous summer months, you want to be wearing a material that will help regulate your temperature but that also has full coverage over your knees and lower leg to prevent rubbing on the leather stirrups. 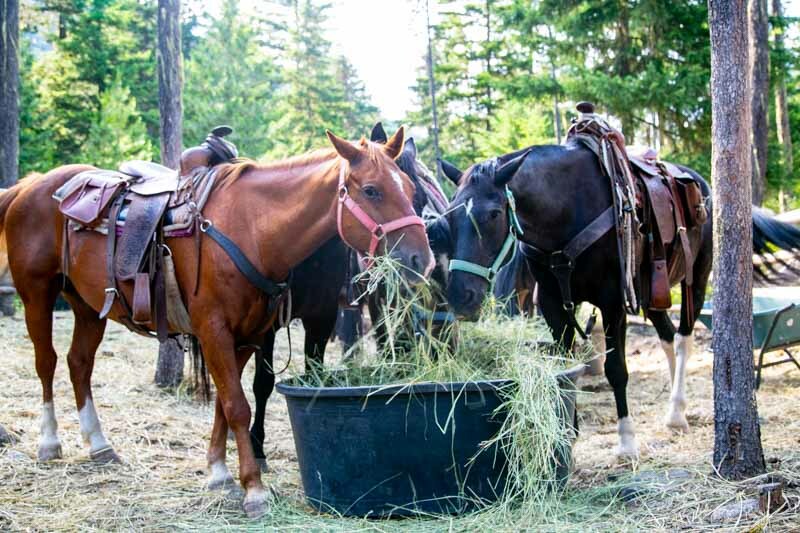 Your horse will have two small saddle bags that are just the right size to carry your lunch (we provide all your meals), water, camera, and any small essentials you might need. We recommend bringing a small tube of sunscreen to pop in the saddle bag so that you can reapply through the heat of the day. As well as your sunglasses and a lightweight long sleeve top. 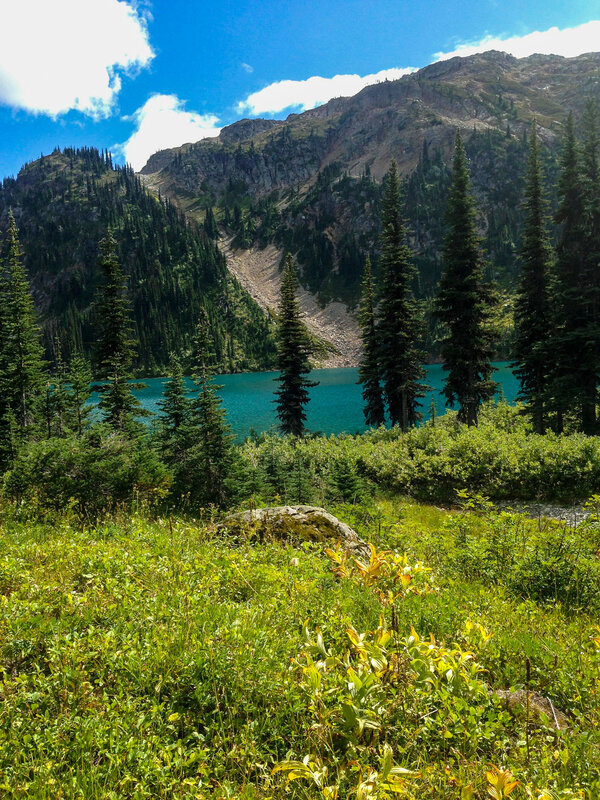 The scenery out in the mountains is beyond words and you're going to want to remember it forever (and show everyone!). Small DSL cameras and compact pocket-sized cameras will fit comfortably in a saddle bag. There is just so much to photograph here, that the most popular solution with our guests is a cross-body strap, which gives you access to your camera while riding. Beginners can do overnight horseback riding trips, easy!